from flooding in the southeastern state of Tabasco, where much of the state capital, Villahermosa, was underwater and the governor said that thousands of people waited onMEXICO CITY, Nov. 3 – Mexicans were gripped Saturday by images of dramatic rescues their rooftops for help to arrive. Newspapers and television showed photos of Navy helicopters scooping up children from roofs and rescuers lowering elderly people into boats. Many of those who could leave on their own waded or swam though chest-high brackish water. The flooding in the state was brought on by days of unrelenting rain, which caused several rivers to overflow. President Felipe Calderón, who has visited Villahermosa twice this week, said that Mexico was facing one of the worst natural disasters in its recent history. But it was hard to gauge how widespread the damage was. 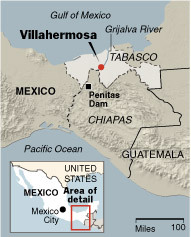 The Tabasco governor, Andrés Granier, who compared Villahermosa to New Orleans after Hurricane Katrina, said that as many as one million of the state’s 2.2 million residents had been affected by the flooding. But it was not clear if they had been left homeless. There was an earlier report that one person had died, but on Saturday Mr. Granier said that he had received no reports of deaths. But with so many people trapped, it was possible the death toll could rise. Marí­a Beatriz Zavala Peniche, Mexico’s secretary for social development, said Friday in a television interview that it was too early to quantify the damage yet. Despite the confusion, it was clear that much of Villahermosa remained paralyzed on Saturday, without clean drinking water and electricity in many areas. There were scattered reports of looting, although the government sent an additional 1,000 soldiers early Saturday to guard stores. The city is an important provincial capital on the low-lying swampy plains leading down to the Gulf of Mexico. It is also the site of the regional headquarters for the state oil monopoly, Petroleos Mexicanos. The rest of the state is largely agricultural, and officials said most of the state’s crops had been destroyed. The flooding is the most serious natural disaster in Mr. Calderón’s 11 months as president. He canceled a trip to Central and South America next week. The flooding was caused by a cold front that brought five days of torrential rain that began last Sunday. There was some respite on Friday when the sun came out. But a new cold front brought more rain on Saturday, although it was lighter.